This article first appeared in the April 19, 2011 edition of the Syracuse Islander Newspaper. In an age where interactive technology is common for the preschooler, a new book that shows how a piece of paper can spark imagination is a refreshing innovation. Unlike other interactive books, Press Here by creative French author/illustrator Hervé Tullet, has no tabs to pull, no scratch and sniff or pop-ups. Press Here, published by Chronicle Books on March 30, 2011, uses pure imagination to fuel the joy that is holding a book and wondering at its possibilities. The first page shows a simple yellow circle and a scripted narrator invites the child to “Press here and turn the page”. When the circle multiplies, the child is encouraged to rub one of them until, with the magical turn of a page, the yellow circle changes to red. The child is told to tilt, shake and blow on the book, causing the circles to rearrange, slide to the edge and even disappear. “Now clap your hands once” the narrator instructs. Wild clapping and laughter escalates as the dots grow larger the more the child claps. It doesn’t take any prodding for young readers to follow the final instructions: “Want to do it all over again?” Trust me, they will. The book itself is meant to be touched. Without a jacket cover, the hardcover book is sturdy and filled with extra-thick pages that are begging to be handled. As an educator, I wondered how this book might be read aloud in a classroom or library group setting. Because the child is being instructed by the book directly, I worried that the teacher or librarian would get bombarded with little people who want to touch, shake and blow on the book themselves. On the publisher’s website, www.chroniclebooks.com/presshere, parents and educators can find great ideas of how to involve the students by dividing them into groups of red, yellow and blue dots and encouraging them to imitate the dots as the adult reads the instructions in the book. The interactive features in Press Here mimic picture book apps that are prevalent in current hand-held technology. Relegating this picture book to a mere app would defeat the purpose: a child can produce magic with his own imagination. 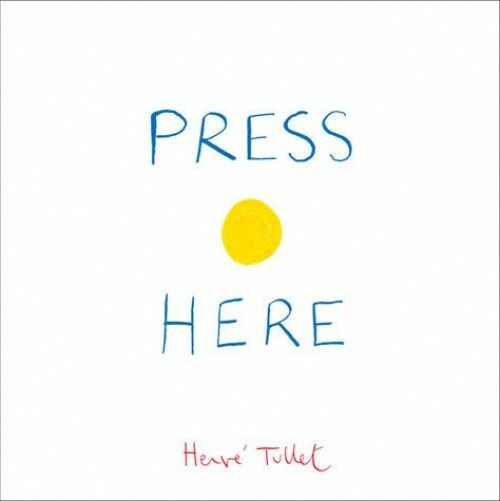 Press Here is targeted for 4-8 year olds, but I’m betting that, no matter your age, once you get your hands on it, you’ll be showing the book to everyone you meet. Go to Chronicle Book's website for a printable mini book of Press Here. This is a wonderfully interactive book for older people to read with younger ones. It's a fun way to teach cause and effect!! I only wish the outer binding looked more finished. I absolutely love the sound of Press Here! I'm looking forward to getting a copy to read with my neice =) I'll definitely keep it ready for my daughter to enjoy when she's old enough.